Few folks realize how limited the human is in the dark. The ability to see in poor light, see past glare, and to adapt quickly to dim light peak during the teenage years. Most of the best gunfighters I know, military or police, are at least in their mid-thirties, because experience takes time; their eyes are twenty years past prime. Add a couple of extra decades, and fighting in the dark gets way more difficult. 20/20 vision drops to less than the criteria for legal blindness immediately upon leaving a lighted area! SureFire recently offered their Low-Light Tactics Trainer Course at Gunsite. I’ve used SureFire lights for years and prefer them to others I have used. If they break, they fix them; if you call with questions, they answer them- in a world dedicated to mediocrity, quality and customer service are nice to see. The class was led by Bill Murphy, the director of the SureFire Institute. 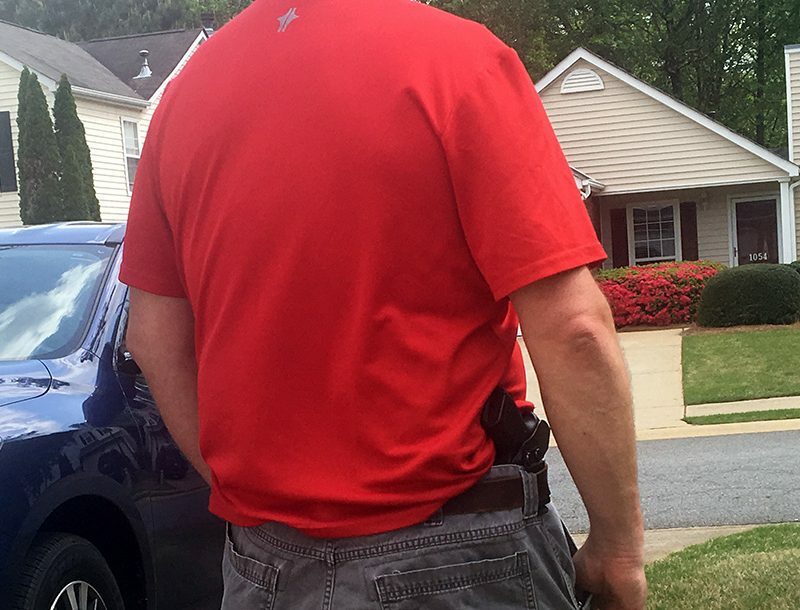 Bill is a Gunsite rangemaster and full-time police officer, with 10 years of S.W.A.T. experience. His co-instructors were Doug Martin, Mike Hughes, and Chris Matthews, all of whom have years of military and police tactical experience, and Mike and Chris are also Gunsite instructors. Scotopic, or starlit illumination, drops from 20/20 to 20/800 in the first two minutes after leaving a lighted area. After 30 minutes, the best the eye can see without a light is 20/180; even with the addition of white light, the best the human eye can see is 20/70, which requires corrective lenses to drive in most states. If you add being wet, tired, cold and scared to the mix, low light shooting is problematic, at best. The class began as all of the best do: we’ll show you what we think works, but won’t require that you do it “our way”- just try it. While techniques are demonstrated, principle is emphasized more (I once took a point-shooting class form an “expert” who had no military or police experience- his way was the only way, forget the tactical toolbox- what a joke.) The principles I took away from SureFire were movement, working angles, dominate with light and controlled aggression. I didn’t agree with all of the material, but came away far more prepared for low light shooting and teaching. Days one and two were square range training with the handgun and the carbine. We practiced shooting, movement, hand-held light techniques, and weapon manipulations (malfunctions and reloads). Speed reloads were encouraged, rather than TAC loads, since most shooting done with a light will be close. I’m a TAC load kinda guy but this made sense within the context of the class. The square range sessions gave us all a chance to practice, and for the instructors to evaluate our abilities. I always figure if I can take away one good thing from a 40 hour class, I did well- by the end of day two, I had at least four good techniques and two solid principles to steal- time well spent. Days three and four emphasized marking cartridges for force-on-force. It is critical that a sterile environment be created and maintained in force-on-force training. 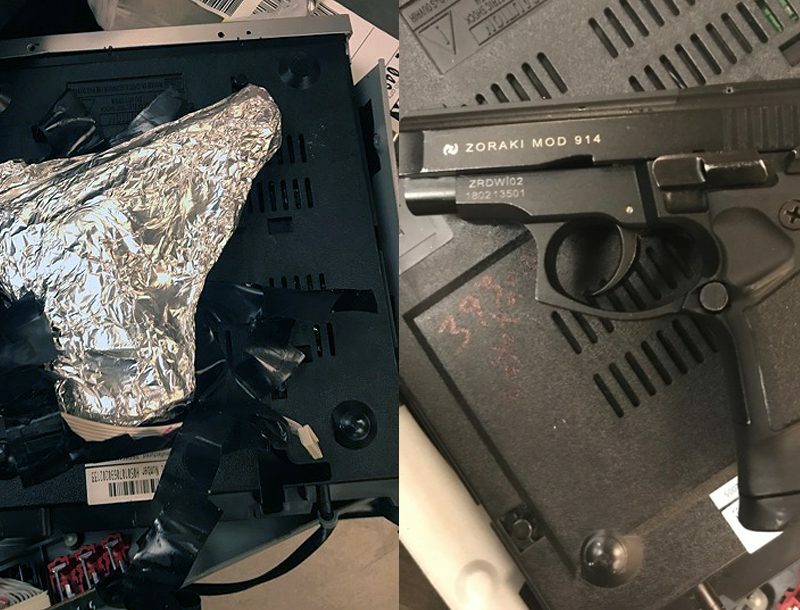 There are lots of guys out there who try to cheat, sneak their ankle gun into the sterile environment, “just in case”- this is a recipe for disaster. The cadre repeatedly emphasized NO weapons; we were searched before each evolution, and not allowed to leave the sterile environment. I had to go back for my camera, and was searched again when I returned. Some trainers think this is overkill, but killed is what you’ll get if the rule is not enforced. I commend the cadre for their diligence in keeping it safe. No one knows how things work until put to the test in force-on-force. The object in searching for a bad guy in a shoothouse is not to shoot him. Searches are a battle of angles, and if you use the angles and use the light correctly, you’ll find and dominate the bad guy before he can shoot you. It worked- as a bad guy, if I didn’t surrender, I looked like a painter’s drop cloth; as a good guy, I never got shot. The techniques and tactics taught by the SureFire Institute worked well, especially in conjunction with the SureFire lights. We began with slow, static searches, guided by the instructors. They explained angles, blocking, covering vectors, and worked us slowly through the shoothouse, repeatedly. We progressed to little, then no guidance, allowing us to learn from our mistakes. They emphasized slow, patient, searches rather than “dynamic” runs through the building- less chance of getting killed. The afternoon of day four was a full-out hunt for goblins, using role players, mission briefs, and flash-bangs, ending with a hostage rescue exercise. Cops are extroverts with destructive tendencies, so adding aggression and explosives made for a great day. One major east coast agency found that 96% of its shooting occurred in low light. They also found that only 4% (FOUR!) of the rounds fired hit the threat. 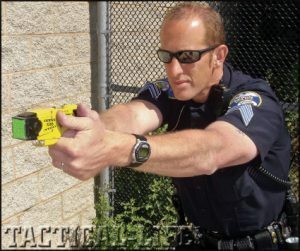 In the litigious world of today, it criminally negligent to continue training as we have in the past- train in the day and tell the officer what to do in the dark. We have to do better if we want to help our officers win fights. Training: As important as gear! It is incredible to me that soldiers, policemen, and armed civilians will agonize over pistol make, model and caliber; .308 vs. .223; Glock or 1911. They’ll spend thousands of dollars on guns, gear, and ammo, spend countless hours and dollars on training, but spend $10 on a Wal-Mart flashlight. The light is at least as critical as the gun, and as much importance should be given the light as the other gear. One of the most impressive aspects of the SureFire Institute class was the information freely given. A complete PowerPoint presentation on CD was provided, with the advice to use it as a basis for agency training. The well-written manual came with sample waivers, class schedules, critical statistics, and vital resources. We were all encouraged to use, modify, to do whatever necessary to spread The Word on dim-light shooting and training. In a world where everything costs extra, or “it’s copyrighted, you can’t use it”, it was refreshing to have saving lives more important than dollars.